Count on us to provide the best electrical service in the industry. We specializing in circuit panel upgrades. We are your preferred electrical contractor. Nothing sets off a room or home like well placed lighting. We offer lighting design services to help you ensure your home is comfortable and inviting. We are the most reliable electrical contractor you will find. Providing a range of electrical work and services, we can handle any project you have. Excel Electric is currently contracted with the City of San Juan Capistrano and has completed work for the Cities of Dana Point and San Clemente. 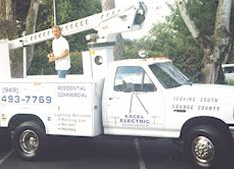 Excel Electric in San Juan Capistrano, California, is an independent and family-owned electrical contractor, specializing in lighting design and electrical panel upgrades. Our company enjoys a remarkable reputation, bringing more than 26 years of experience to every project. Count on our expertise anytime you need electrical work done. We are fully licensed, bonded, and insured. Let us provide you with the best possible service! We are happy to speak with you regarding any of our services, so please fill out the provided form with a detailed message and specific callback request. Once you click "Submit," a confirmation message will appear. With the information you provide, we can better serve you for your 100% satisfaction.